Topics: Interest Groups, Action Committees, and Scholarships. 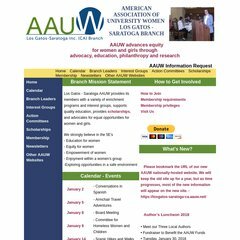 Aauw-lgs.org's server IP number is 72.34.63.163. It has 2 DNS records, ns1.webdogs.biz, and ns2.webdogs.biz. Ihnetworks Llc California is the location of the Apache server. PING (72.34.63.163) 56(84) bytes of data.